What is Fostering and How Does it Differ From Adopting? How much will it cost to foster a dachshund? For each dog that we bring in and place with a foster family, a life is saved. If you foster, you save a life. Fostering is a very rewarding way to help our rescue! Our absolute NUMBER ONE need is for more foster families. One available home saves one more dog. So, the most important volunteer position that we offer is a humble request for you to work with one of our dogs...a dog that will be saved because you opened your home, your family, your time, your arms, and your heart to a scared little dog who needed saving. Saying ‘yes’ to a dog that needs saving is the ultimate act of rescue! If we don’t have an available home; we have to say no to taking in the dog. The ideal foster family should have some general experience with dogs and be familiar with basic dog care and training. As with any breed-specific rescue, having some knowledge about dachshunds is a big plus, too! The dogs we receive and place are all ages, temperaments, and backgrounds. Many will be adults or seniors and come from difficult backgrounds. We do have puppies a few times each year. Regardless of where the dog comes from or what their age is, there will some dogs that are going to be a challenge to foster. Some of them might have behavior problems that led to their surrender. Others might be sick. Many will not be house-trained. But there will also be dogs that are sweet, well-behaved, housetrained, a joy to be around, and may just become a permanent member of YOUR family. We do hate to lose a foster family, but finding that the dog the perfect forever family is our ultimate goal! Q: What is the difference between fostering and adopting? A: Fostering is the interim home the dog is placed in after it is surrendered to us. A foster home is temporary. Foster families take the dog to the vet for any needed procedures. They help potty train (if needed) and assess the dog for proper adoption placement. Adoption is a permanent placement. Q: How much will it cost me to foster a dog? A: NDR pays for all vet care. We do ask that you feed them whatever you are currently feeding your other dogs. Crates, leashes, bowls...etc... We can provide all of this, if it is needed. Q: I am interested in Fostering a dog, how do I start the process? A: You will need to fill out a Foster application. A home visit will be performed and once you are approved, we will most likely place a dog with you in a very short time. Please visit our Foster Application page. Please note - You must have a securely fenced area for outdoor business and exercise. Invisible fencing may not be substituted for a wood/metal/composite fence. Q: I am looking for a particular gender, coat, color, size, or age. Is that allowed? A: Generally, our foster families are open to take in ‘the next available’ dog that needs help. Since it is not a permanent placement, we are hoping that foster families will be accepting of any dog that needs a temporary home. There are obvious exceptions to this, of course! Q: How long will the foster dog stay with my family? A: Some dogs are harder to place than others. It is just a fact of rescue. Some will go in less than a week and some will take months to place. Great pictures, a well-written bio, and taking them to our sponsored events help even the hard to place dog find a wonderful home. What kind of FOSTER FAMILY does Nebraska Dachshund Rescue look for? • Welcoming them into your family and showering them with much-needed love and attention! • Feed a healthy diet to maintain an ideal weight. Walk them. Play with them. Train them. • Bring them to at least one sponsored NDR event per month so they can meet interested adopters. • Keep them as an inside pet and will not ever be left outside unattended. Doggie doors can only be used if owner is home. • Provide updated profiles to NDR so that we can properly ‘advertise’ the foster dog’s qualities...both good and bad. We dont want to hide anything from a potential new adopter. The role of the foster family is to provide a caring, temporary home and rehabilitation for a dachshund in need. Providing consistent food, a warm safe place to sleep, kind words, and patient socialization are the standard elements of a good foster home. • and others are unwanted by breeders or confiscated from puppy mills. • Some rescued dachshunds have previously been in a home, and are partially or fully house-trained. They have been cared for at one point, have experienced a variety of life situations, and understand the basic human-animal bond. Often they are well-adjusted emotionally and will adapt easily to a foster family or new home. • Other rescued dachshunds have come from a situation where they were not able to establish a bond with a person. They may have been neglected, and lack social skills or manners. They can have health issues resulting from neglect, and will require a caring foster family willing to work with them to help them become a well-adjusted pet for their future family. • Finally, there are dachshunds that have been rescued from bad breeding situations, hoarders, or puppy mills. Often these dogs are never let out of their hutch or cage their entire lives. They do not know what walking in the grass is, or how to behave around people or in a house. They have received little or no veterinary care, have health issues, and are extremely fearful or shy. These dogs need a patient, loving foster family to help them learn how to be a dog, and discover the new world around them. With the help of a loving foster family, we have seen that all types of dogs can blossom and become treasured, forever companions to their new families. The length of time dogs remain in foster families also varies. We do everything we can to spread the word that our rescue dachshunds are available. Some are in foster care for a few weeks, and some for a few months. Some are even adopted by their foster families! The out-of-pocket costs to you of being a foster parent are daily food and shelter. All medical expenses or medications will be funded / reimbursed by Nebraska Dachshund Rescue. Your rescue dog will be examined by a veterinarian, receive vaccinations, and be spayed/neutered either before you receive it or right after. As an NDR Foster Family, you will work closely with an assigned Foster Advocate and the Foster Director. They are valuable resources, dedicated to working along side you during the fostering experience. They are available to answer questions, arrange for any medical care necessary, assist in training or behavioral issues, etc. Best of all, they have fostered multiple rescue dogs themselves, so they have a first-hand knowledge of the process. 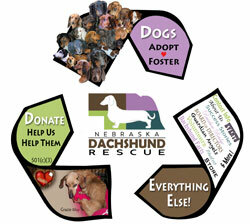 Nebraska Dachshund rescue is in desperate need of caring Foster Families. Every day we are presented with more needy dachshunds, and when there are no foster families to help take them in, it can be a heart-wrenching ordeal to turn any away. Won’t you please consider temporarily opening your home to a homeless dachshund? You will become a vital link in saving a sweet dachshund’s life, and helping to shape a future forever companion. Thank you for your interest in fostering a rescued dachshund!